As one of California’s premier resorts, Martin Resorts prides itself in offering guests opportunities to experience access to beautiful beaches, astonishing coastal views and experiences in vacation and event planning. 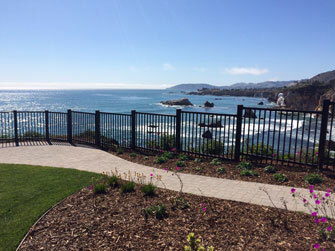 Recently, three miles of metallic architectural fencing had to be replaced due to the damaging effects from exposure to ultraviolet light, saltwater spray and winds from the Pacific Ocean. Within eight years, the original metallic fencing had oxidized, becoming an eyesore for guests and a concern for maintenance personnel. Due to the nature of metallic fences, corrosion/rust can quickly create safety concerns. As the owners reviewed options with Allco Fence Industries, they determined that a durable, noncorrosive fence would best serve the needs of the Martin Resorts facility and its guests. Allco recommended Strongwell’s STRONGRAIL® architectural handrail and fencing system due to its ease of installation, fabrication, color options, corrosion resistance, durability, and Strongwell’s reputation in the market. In coastal and marine installations the durability of STRONGRAIL® is expected to extend beyond multiplelifecycles of aluminum, steel or wood fencing, furthering the return on investment. The project is planned in phases. During phase one, over 1,300 lineal feet of STRONGRAIL® was installed by Allco Fence Industries for the resort’s main Gazebo area, proving itself as an easy-to-install and attractive-looking solution. 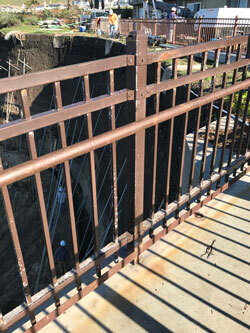 Additional phases will replace the remaining 14,000+ lineal feet of corroded metallic railing over the next two years. To view the case study in its entirety, please click here.